Summary: Fourteen-year-old Maggie Trafford leads a normal life. Well, as normal as being crammed in a three-bedroom house with four siblings and a single parent can be, anyway. But despite being somewhat ignored at home, Maggie excels, earning top grades, a best friend who would do anything for her, and stolen looks from a boy in Maths. No longer alone in her fear, Maggie and the world watch with bated breath as one after another, the historic stones tumble, like a clock counting down. But only Maggie knows what it means: when the last stone falls, destruction will reign. And when the world ends, there’s only one option left—survive. Horrifying and raw, Dare to Dream is equal parts tragedy and hope, detailing the aftermath of apocalyptic catastrophe, the quest for survival, and the importance of belief. Review: Looook at this cover!!! It's so beautiful *_* I was actually recently in the UK and went to Stonehenge, so the timing on this is perfect! I have a thing for fiction where someone completely ordinary finds out that there's something extraordinary about them, or figures out that something extraordinary is going to happen. So as you can imagine, when I read this summary I was fascinated and wanted to know more! I think one of my favourite things about this book was the build-up. So often apocalyptic fiction focuses on the action - and for good reason, of course, since that's what fascinates a lot of people. Sometimes, however, that is at the expense of character development or even just world building - if I'm going to read about a world being torn apart, the author had better make sure that I care about the world and the people in it, and illustrate fully why what's about to happen is a bad thing. So this book does a great job of that. Maggie's home life isn't the happiest - she has four siblings, a small house, a mother run ragged. 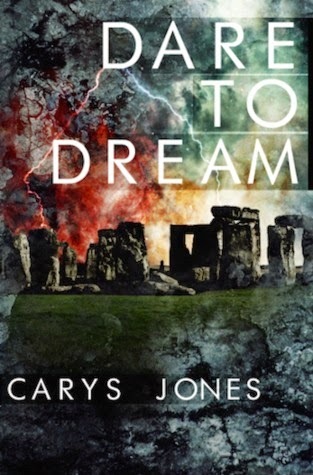 When things start going haywire, all of that adds to the pressure on Maggie's shoulders as she finds nightmares plaguing her, seemingly in sync with the mysterious events at Stonehenge... Then when the proverbial crap hits the fan things really get fascinating as the world falls apart around them and Maggie and her two friends find themselves running for their lives, struggling for basic survival and to keep themselves hidden. At times the plot dragged, however. Finding a balance between build-up and dragging is very difficult and there were points where I wanted things to move along just a wee bit faster, particularly in the first part of the book. The repetition of dreams, fights with her mother and siblings, difficulty at school, etc, all became a bit too much after awhile. In the second half of the book things were much better, though it did remind me of the complaints that people had about the 'tramping through the forest' in the Deathly Hallows! The end of the book was also a bit uneven and left me with a lot of questions. What's going on? Who caused it? What's going to happen next? To what end is all of this going on? Etc. None of that is a bad thing, I just wished that we'd gotten some more hints along the way, but it serves as a bit of a build-up for book two. Disclaimer: I received a copy of this book from the author in exchange for an honest review. Teas, books and trips, oh my!